Dame's is where crispy, Southern fried perfection meets deliciously sweet European decadence. Dame's pairings are world-class, comfort food combinations meant to fulfill your appetite's and heart's desires. 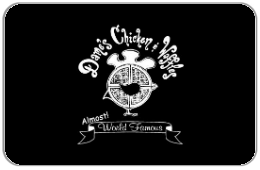 From "first-timers" to "barnyard veterans", Dame's Almost World Famous Chicken & Waffle inspirations are truly palette pleasing pairings that offer something special for all comers. We hope you enjoy every morsel. But be careful, these dishes are truly, smack yo' Mama good!